Saint Louis scored 13 runs in the second inning, setting a SLU record for runs in an inning, as the Billikens defeated Saint Joseph’s 22-6. The win moves SLU to 17-24 overall and 8-4 in A-10 games. 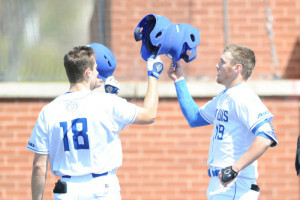 The Billikens also set school records for hit by pitch in a game with nine, one away from the NCAA record, held by Saint Joseph’s.